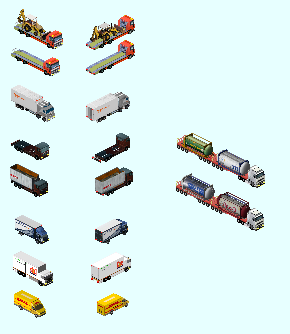 I done a pak of Geodis, Calberson and Geodis-Calberson trucks and trailers. They're very lots of possible combinaisons, so I hope you'll enjoy my work and good game ! Very good!! I love European trailers, these are great, thank you! I will use it in my extended version! new trucks and trailer for pak128, are 6 trucks, and 4 trailer of liquid food + truck Volvofh16. this post had already done, but by some mistake, the file was wrong, here is the right file. Hi, I bring a new package of trailers today. And if you have any problems, let me know. Sheldon hat in seinem Profil nur Englisch und Portugiesisch angegeben, bringt also nicht viel, ihn auf Deutsch anzuschreiben. Wenn du selber kein Englisch kannst, versuchs zumindest mit dem Google Übersetzer oder ähnlichem, denn nur Fremdsprache ohne zumindest rudimentärer englischen Übersetzung entspricht nicht den hiesigen Forenregeln. Lauscher was confused why the addons don't work with any of his pakset versions, but he uses pak128.German instead of pak128. I told him they are different paksets, and that he should use english (Google Translator if there is no other way), especially if talking to someone who probably does not even speak German. Und irgendwas ist durcheinandergewürfelt: Pak128.german in Version 0.10.4 ist Revision 2135. Rev. 8504 muss die einer ST-Version sein, genauer der 120.3. Und dort wird vermutlich auch der Hund begraben sein: Die von sheldon verwendete makeobj-Version wird zu neu für ein älteres ST sein? Sry, kann leider nicht testen, Dropbox darf bei mir nicht. Maybe the used makeobj-version is newer than the ST-version from Lauscher? Hello, I use Simutrans pak128 120.4.1. all the files I created were tested only for pak128 in that version. I can not answer that these trailer and trucks should open for pak128 German, or Pak128 Japan, because I did not do tests related to these pak. However, it should open to other pak, as I use the recent default makeobj in my creation. try to download the latest nightly extension, maybe it might help. I'm going to do some tests here for pak128 ermam, any news, I'll let you know. a question for the forum people wiser than me, I use the default makeobj to make the files, if I want to make files for pak128 german or japan, should I use another makeobj ?? Or should I just, at creation time, write in the CMD of the default makeobj '' makeobj pak128 germam '' ?? I use the default makeobj to make the files, if I want to make files for pak128 german or japan, should I use another makeobj ?? Or should I just, at creation time, write in the CMD of the default makeobj '' makeobj pak128 germam '' ?? The actual issue would probably be the goods, if they don't exist with the same name in pak128.german, your vehicles would stop the pakset from loading correctly, no matter which version is in use. Exact! I had forgotten that detail. 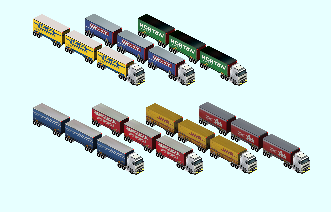 With that, the trailers and truck that I created, will only work for pak128, with exeções for some pak that accept the products edited in English. Correct Leartin ?? But he does make them for everyone, that's why he shares them. This is a gift. All these add-ons were made for the game and shared, all the add-ons I've done share. The only problem is that I do only for pak128, and I do not have time to do for other paks, like pak128 German or pak128 Japan. I believe you play with pak128 German, my tip, is that you add pak128 products, the called '' good.pak '' in your pak folder, and businesses. Game with Simutrans pak128 120.4.1, I have files in my pak folder, which are German, however, to open it in my game, I did what I said above. Unfortunately, it is more difficult to make files, because I went back to work, and I am missing time, but as soon as I do something else, I will post here in the forum. Thank you for your understanding. Wow...it's a very cool and high quality add-on! I think that the point that rich in variety is amazing! Transportation using the road becomes lively. I'm rooting for your future success! I have no time to make new paintings and addons, as I said, the work is preventing me, but this year end, I will be with a little time and try to do something else, like this work, I hope you enjoy. any problems, or bug, please report here, and I will try to fix it as soon as possible..